HOUSTON, Texas — The longtime senior worship leader for megachurch self-help author and motivational speaker Joel Osteen is raising concerns after he was recently photographed in Mexico with a woman not his wife just weeks after announcing his divorce. On February 22, Houghton, a five-time Grammy Award Gospel singer known for his songs “Friend of God,” “Not Forgotten” and “Moving Forward,” announced publicly on social media that he and his wife had divorced. “It is with a collective heavy heart that we announce that after over 20 years of marriage and a long separation, Meleasa and I are officially divorced,” he wrote. Without providing details, Houghton explained that he had “sinned” in his marriage and was unable to fully restore the relationship. Houghton apologized for the hurt that his actions had caused. 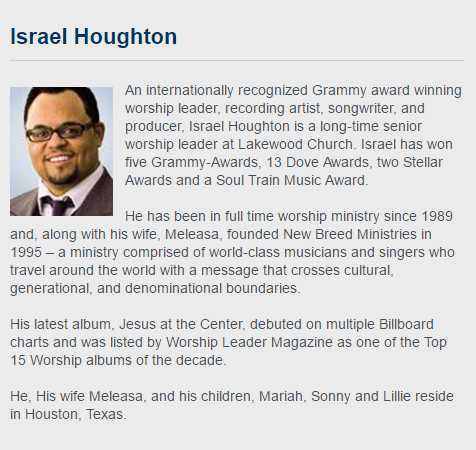 The post has since been deleted, and some followers expressed concern that Houghton had continued serving as worship leader at Lakewood while living in sin, as well as singing in general with Israel and New Breed. Houghton and the woman not his wife. This past week, Houghton, 44, was spotted in Tulum, Mexico with a woman who is not his wife. Actress Adrienne Bailon, 32, donned a scantily-clad bikini as she and Houghton vacationed together on the beach. The two were photographed embracing and kissing in the water. Bailon is the former girlfriend of Rob Kardashian, and had been engaged to Lenny Santiago until she ended the relationship in September. Houghton met Bailon three years ago while working on the film “I’m In Love With a Church Girl,” which he produced. The development and photographic evidence quickly prompted concern, and some wondered if Bailon had anything to do with the divorce. Houghton shown on staff at Lakewood in this screenshot from November 2015. A defiant Houghton took to social media on Tuesday to acknowledge the relationship, but to clear Bailon of any wrongdoing. “My marriage had been over for quite some time before going public with my divorce announcement,” he said. Houghton suggested that others shouldn’t scrutinize his life but focus on bigger problems in the world. A cached image of Lakewood’s leadership page from late November 2015, one of the last archived images available, shows Houghton still being on staff at that time. (See above.) His photo and bio were removed at some point between December and this month. The representative further stated that they were not at liberty to provide details about Houghton’s situation, but advised that Lakewood officials are willing to provide spiritual counsel if Houghton so desires. He had served as Osteen’s worship leader for 14 years and had also spoken at the podium on several occasions.